Those who live in or frequent Dallas know it has become one of the country’s premier spots for dining. Restaurants that are on the forefront of culinary trends and/or that embrace a modern southern mentality represent some of the finest options not just in the city, but nationwide. Here are the top 10 restaurants in Dallas. Bring your appetite, and, if you’re squeamish, perhaps a blindfold to one of the favorite restaurants in Dallas. The carnitas are all the rage. But when you order them, you’ll be presented with a half of an actual pig’s face on your plate. If you can get past the visual, the taste will blow your mind. “This is uncommonly good and primal eating,” said the Dallas Observer. Dallas’ bar none favorite pizza place is in deep Ellum and is also noted for having one of the city’s best dog-friendly patios,” said Dallas Eater. Their recommendation: the Delia with housemade bacon marmalade. 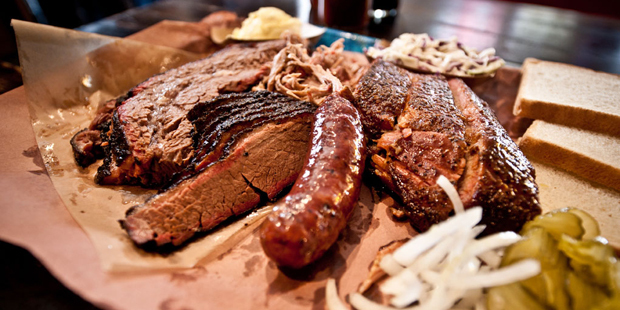 When it comes to barbecue, you just can’t have a civilized conversation in Texas about the very best. Everyone has a fave, and, quite frankly, many folks will tell you to head due south to find “real” Texas barbecue. That aside, many spots will have your taste buds singing. Dallas News’ 2014 poll crowned a winner in Hutchins BBQ up Interstate 75 from Dallas in McKinney. CBS likes Hard Eight (the runner-up in the Dallas News’ poll) in Coppell. Take your pick and name your fave! Expect a similar fight when trying to come up with the definitive best burger winner when discussing restaurants in Dallas. You can’t go wrong with Off Site Kitchen, Shady’s Burger Joint, orWingfields. But for our money—and calorie count for the week—it’s all about Angry Dog. If you like your burger with all kinds of crazy stuff on it, this one isn’t for you. But for burger purists it’s just, well, incredibly yummy. Dallas News gushes over this “wonderful trattoria in the Bishop Arts District,” and for good reason.Lucia‘s menu is innovative, the food is delicious, and the wait is long. Make a reservation in advance and try hard not to fill up on the delicious bread and butter while you’re waiting for your entree to arrive. Eater’s choice for a yummy neighborhood restaurant is a local fave that serves Mediterranean fare.Afghan Grill has “Outstanding kebabs and hummus, but this is a good place to stray from the usual because everything is great—try the mantoo (meat-stuffed dumplings) or kadu (pumpkin smothered in yogurt and meat sauce),” they said. Renowned chef John Tesar’s newest offering, Knife has been the talk of the town—and the culinary world—since its opening. The modern steakhouse offers a dizzying array of meat plus a slight obsession with bacon that, frankly, makes us happy. “A meal at FT-33 speaks for itself,” said the Dallas Observer. “This is arguably the hottest reservation in Dallas right now. And it likely will be for some time. Dallas News asked Leslie Bremmer for a list of her favorite Dallas restaurants for visiting foodies, and right at the top was Smoke. “Chef Tim Byres has gotten national attention for his Modern Texan cooking, and he throws in some more traditional dishes as well. The vibe is super cool.” Bremmer’s don’t miss: cabrito and masa. Call 800-653-9891 to talk to an expert at Lake Ridge, or contact us today!